Whether you are planning a celebration, wedding reception, dinner party, luncheon, or corporate event, Claverach Farm offers an idyllic stage for memorable occasions. We can prepare beautiful, multi-course menus for private events inspired by farm-fresh ingredients. 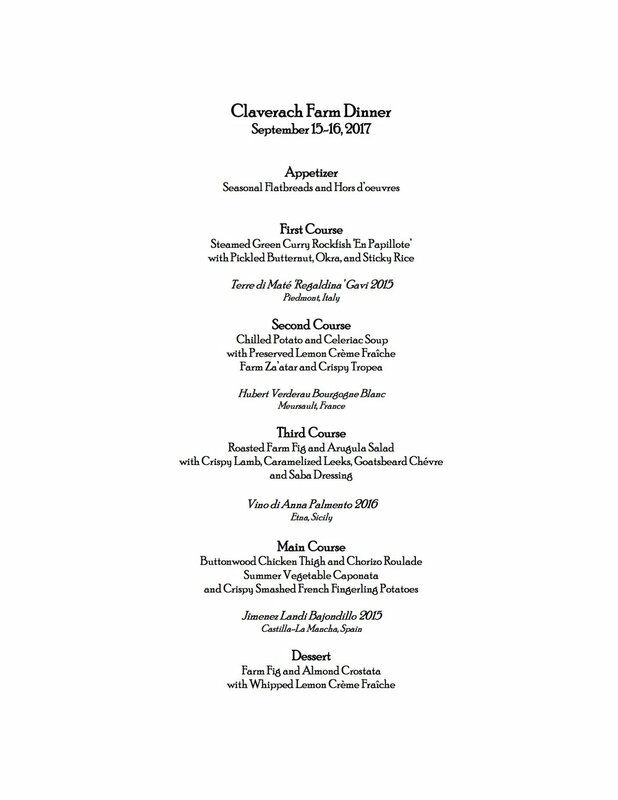 Claverach Farm is an ideal venue for food and wine lovers. All of the produce that we use for our events is all grown right here on the farm. We rely on our relationships with local farmer friends for local sources of beef, pork, chicken, lamb, and dairy. We also occasionally splurge for seafood when we can find something sustainable and at the peak of its freshness. Dinner events are generally four to five courses plus hors d’oeuvres. We also have brunch, lunch, and buffet options. Please note that while we will work with you to design a menu to suit your tastes, we strive to be as farm-to-table as possible. Our menus are always based on the produce that we grow here on the farm and local meats. As such, our menus are restricted by seasonality and availability. We can accommodate vegetarian, gluten-free, and dairy-free diets, as well as nut or shellfish allergies. We cannot accommodate any other dietary restrictions. Because we import organic, biodynamic, and sustainably-farmed wines from around the world, we have an extensive cellar from which to draw for your events. Many of the wines we work with are not available anywhere else in the state! We also source beer from local micro-breweries and can create farm-inspired cocktails for your event. 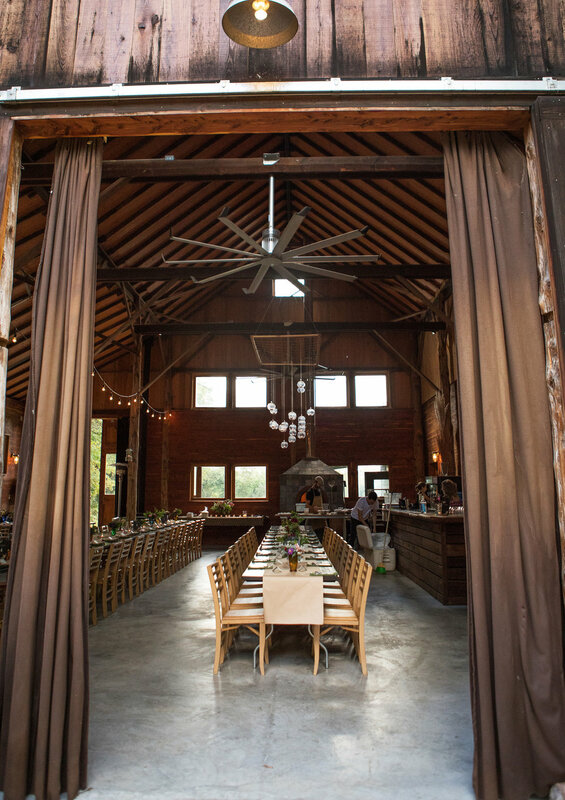 Events are held in our beautiful 120-year-old renovated barn that can accommodate up to 88 people. Guests are seated at long, communal tables. In addition, Claverach is an ideal venue for nature lovers. The property has been in the family for over 100 years and, as such, looks much more what you would find in the southern Ozark Mountains than something so close to St. Louis. It has been undisturbed from development, logging, and intensive agriculture. Private event attendees are encouraged to walk around the beautiful gardens and vineyards right outside our barn's doors. While we strive to create an elegant food experience, eating at the farm will bring you closer to nature than dining at most restaurants. The barn is warmer in the summer and cooler in the winter than a climate-controlled building, so we recommend dressing for the season. You can also expect a short walk up our gravel driveway from the parking area to the barn, and having to leave the barn to visit our bathrooms (modern, be assured) located across the courtyard.